PORT CANAVERAL, Florida - On the morning of Wednesday, March 1, 2017, Brevard County Sheriff's Office Corporal Evan Hightower responded to a report of a sea turtle in distress near the rocks at Jetty Park in Port Canaveral, Florida. When he arrived, Cpl. Hightower observed a green sea turtle that was tangled in fishing line and appeared to be hooked. The sea turtle was in need of immediate assistance so Cpl. 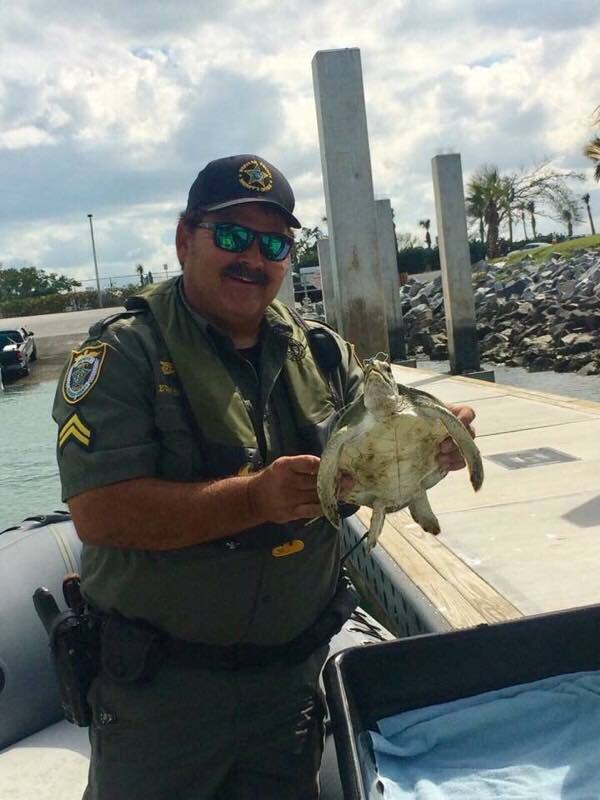 Hightower maneuvered his assigned Brevard County Sheriff's Office boat near the Port Canaveral entrance to the jetties, where he was able to safely bring the turtle onboard. Once the sea turtle was aboard, the animal was carefully transported to the Port Canaveral boat ramp where it was turned over to a staff member from the Sea Turtle Preservation Society. The sea turtle, which is estimated to be between three and five years of age, was then transported to the Brevard Sea Turtle Healing Center where it was determined it had ingested a fishing hook. Surgery was subsequently conducted to remove the hook and the turtle is now recovering. Once fully recovered, the turtle will be released back into it's natural habitat by members of the Healing Center Team. "Ironically, Cpl. Hightower had just attended the Sea Turtle Preservation Society, Sea Turtle and Wildlife Rescue Training the day before the rescue," said Brevard County Sheriff Wayne Ivey in a statement. "There is no doubt that the training Cpl. Hightower received gave him the needed skills and knowledge to successfully conduct the rescue."